Holkham Camp, or Holkham Fort, is an Iron Age fort in Norfolk, England, about 1 mile (1.6 km) north-west of the village of Holkham. 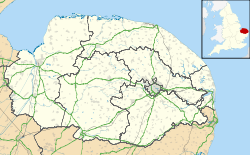 It is in the Holkham National Nature Reserve, at the southern end of a sandy spit, with coastal dunes to the north and tidal wetlands on the other sides. The site is not normally accessible on foot; it can be seen from an elevated bird hide on the edge of woods to the north. It is near two other Iron Age enclosures: about 5.5 miles (8.9 km) north of Bloodgate Hill Iron Age Fort, and about 5 miles (8.0 km) northwest of Warham Camp. It is an oval enclosure, area about 2.5 hectares (6.2 acres). The western side is protected by a slope, and by a creek on the south-west. The eastern side has a single rampart and ditch, with an additional outer bank at the south-east. There is a gap in the banks about 9 metres (30 ft) wide on the south side, thought to be the location of the original entrance. It has been a scheduled monument since December 1924. During the Iron Age and Roman era, the site was in the area of the Iceni tribe. Holkham Camp is one of two possible sites (the other being Stonea Camp in the Cambridgeshire fens) corresponding to the description by the Roman historian Tacitus of the location of the defeat in AD 47 of Iceni rebels by a Roman force commanded by Ostorius Scapula. The site may have been a feature in Mesolithic and Neolithic times, since finds include worked flints from these periods; they are thought to have been in their original location, as the site has not been ploughed. ^ a b c d e f Holkham Iron Age fort and possible Mesolithic to Neolithic occupation site Norfolk County Council, accessed 1 April 2017. ^ Holkham Iron Age fort (Places to Visit) Norfolk County Council, accessed 1 April 2017. ^ Richard Wainwright. A Guide to the Prehistoric Remains in Britain. Volume 1: South and East. Constable, 1979. Page 299.